Kern River Outfitters has scheduled two of their popular two-day Lower Kern rafting trips as specialty “theme trips”. Kern River Outfitters, a Southern California whitewater rafting outfitter, will offer two theme trips on the Kern River in 2010. 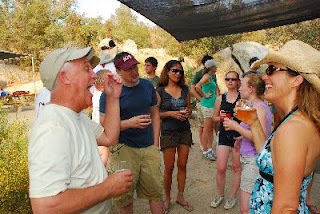 A Wine Tasting trip is scheduled for June 17-18 and a Pub & Grub trip featuring craft beers from the Kern River Brewing Company will take place July 8-9. Both trips are two days and are in combination with Kern River Outfitters’ popular Lower Kern rafting trip. The June Whitewater and Wine Tasting trip will feature a broad sampling of varietal wines from Central California vintners. Tastings will be complimented by tasty hors d’oeuvres followed by a wonderful dinner prepared by the Kern River Outfitters crew. Partnering with the Kern River Brewing Company, the Pub & Grub trip features a variety of different ales from the brewery, as well as a few home brews. Eric & Rebecca Giddens, founders of the popular local brew pub, will join Kern River Outfitters at camp to talk about their brews, the art of brewing and the role beer is playing in restaurants of all culinary persuasions across the country. The Kern River is often touted as the best whitewater rafting river in California. Kern River Outfitters runs rafting trips from two hours to three days in length, with Class II to Class V rapids on the Lower, Upper, and Forks of the Kern. For additional information on rafting the Kern River, contact Kern River Outfitters at 1-800-323-4234 or visit http://www.KernRafting.com.